Bynum uses his size to get fantastic post position and make a good move. Even though he misses, he grabs the offensive rebound for an easy put-back. 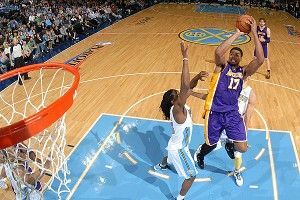 But after the layup, Bynum shows off, costing him precious seconds as Faried flies down the court toward the basket. All Bynum can do is get mad at his teammates for not helping as Faried finishes at the rim. Pau Gasol takes a shot out on the wing, which Faried contests. He holds his position until he sees the Nuggets control the rebound, then he sprints down the court like he was shot out of a cannon. Gasol keeps up with Faried, but with Bynum lagging behind, he has to defend two bigs. Faried spaces out, makes the catch, and knocks down the jumper. Faried boxes out Gasol until JaVale McGee secures the rebound, and then he flies. It’s like a car in the left lane speeding past trucks. Gasol simply doesn’t have the athletic ability to keep up with Faried. Meanwhile, watch Bynum throughout this sequence. He releases as soon as Kobe lets go of the basketball and starts heading back, but he hasn’t even reached the free throw line as Ty Lawson throws a beautiful over-the-top pass to Faried, who converts for the easy finish. This iteration begins with Faried grabbing the rebound himself and kicking it to a guard. Bynum trails the play while Jordan Hill tries to keep up with Faried. Matt Barnes has to sink into the middle to prevent another over-the-top pass, but that opens up his man, Andre Miller. Lawson finds Miller, who finds Arron Afflalo for the wide-open 3. Why is he wide open? Because Bynum isn’t in a position to close out on him. Faried and McGee shouldn’t be able to contend with the Lakers frontcourt. Yet the Nuggets scored 13 points off rim-runs and beat the Lakers in points in the paint. If Bynum doesn’t pick up the activity level, Denver might be able to extend the series to a Game 7.